Yes, there is a work party this weekend. Sunday, May 26th from 10-4. We’ll be building the first round raised bed, the first water cistern, scraping the asphalt, laying cardboard and spreading wood chips. Please come and help! Bring tools and friends! A few years ago, a couple of neighbors had the idea to approach ODOT (the owner of this lot) about doing a beautification project. The project has finally been approved and a garden is on the way. This is a slow process. 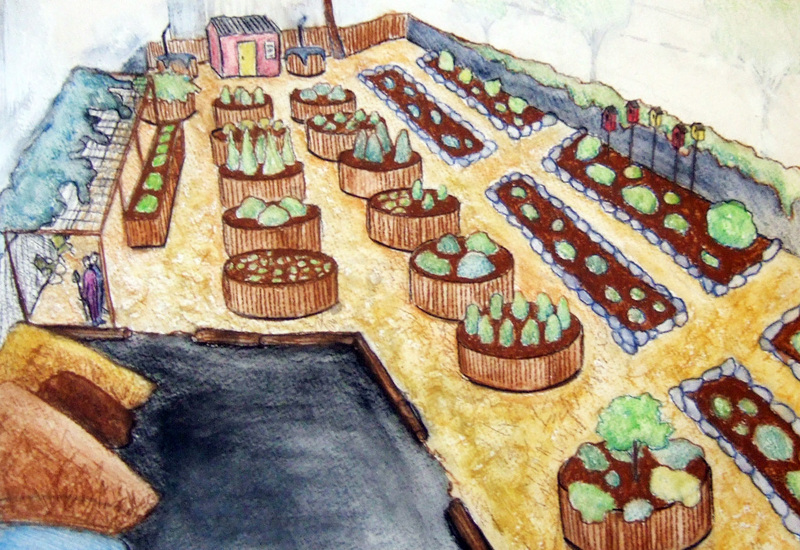 The more help we have from neighbors, the faster we can realize and enjoy the final garden. Our challenge is that we cannot depave or disturb the visible soil. A gas station is buried beneath this lot and ODOT is not giving us permission to work in the soil. That also means that we have no water on the site and cannot have a tap installed. The current plan is to build cisterns to catch water in the winter (from the gutters at the back of the lot) and get water delivered to the site in the summer (to a cistern in the front of the lot). 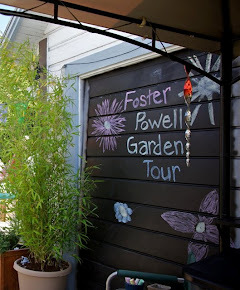 The Foster Powell Neighborhood Association is supporting some of the start up costs for this project but we do not have enough funding and donations secured to finish this garden yet (we’re working on it). We are trying to do as much as possible with free materials which makes your volunteer labor and legwork the most valuable resource we have. The spirit of this project is the beautification of this space at the entrance to our neighborhood. While individual plots may eventually be available, no one is reserving space at this time. The drawing you see here is the basic plan that ODOT agrees to, but the idea is organic and, as time passes and input and materials are received, the design continues to change. If you would like to have input on the project or how the space will be maintained, you are invited to pick up a shovel! 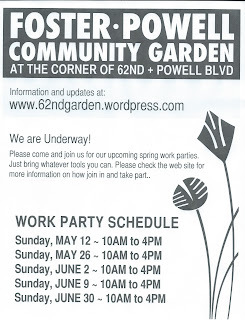 To find out how you can join the steering committee for this project, please email Vicki at: 62ndgarden@gmail.com and visit the website www.62ndgarden.wordpress.com to find out what’s been going on, what supplies we need and when you can come and lend a hand. The Backyard Habitat Certification Program is generously donating a gift cerficate good for the program's certification fee! 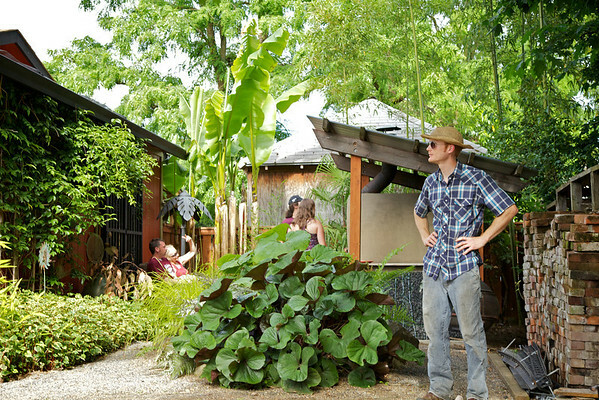 The Backyard Habitat Certification Program provides assistance and incentives to residents on lots less than one acre, within the cities of Portland and Lake Oswego, to restore native wildlife habitat in their backyards. There are four program elements: removal of aggressive weeds, naturescaping with native plants, stormwater management and wildlife stewardship. Sarah & Tim of The Egg Carton are Generously donating a $15 gift certificate! A food cart where the egg ALWAYS comes first! The Egg Carton is family run by Sarah and Tim Arkwright. We pride ourselves on both our service and our fantastic food and drinks. The Egg Carton has been named one of the top food carts in Portland and one of the friendliest. Come on down and visit our pride and joy. Linda Austin of Performance Works NW is generously donating a pair of tickets to her 30th Anniversary performance, REACH:30 running 6/27-6/30! Performance Works NorthWest/Linda Austin Dance (PWNW) advances the performing arts in the Pacific Northwest through the development of contemporary performance, artists and audiences. As an artist-run incubator for contemporary performance, PWNW simultaneously nurtures local artists and provides opportunities for nationally renowned performers to present their work to Portland audiences and lead master classes for Portland artists. Elmer's Flag & Banner is generously donating a $20 gift certificate as well as a special discount coupon! At Elmer's Flag and Banner, Kites Too! we practically invented the modern feather flag....... although we must give credit to 3000 years of Chinese art and history. Mike Hale, a student of Oriental art and a practitioner of Chinese art and calligraphy, began building feather flags in the mid 80’s. He noticed that if you give a Westerner a piece of paper and ask them to draw a flag, they will draw a horizontal rectangle. However, over half of the world from China, Japan, India, etc. traditionally will draw a tall vertical shape. From Teardrops to Custom Sculpted Feather Shapes, we sew in house to control quality. Whether you need a hundred (or a just a few) custom flags or feathers, we use the method best suited to your job needs at Elmer's Flag & Banner. We have 45 years of experience and rely on our huge volume and long time relationships to get you the best process, the best quality, the best price, and the best service. All this spells VALUE for you. Trust the guys who originated the printed Feather Arte Flag! Lan Su Chinese Garden is generously donating 6 pairs of tickets to the garden! Lan Su Chinese Garden sheds the cold and gray of winter to “drink in the fragrance” of spring with two months of plants, flowers and everything blooming! Featuring four of China’s most auspicious and culturally significant plants: rhododendrons, camellias, peonies and magnolias, April and May will be filled with sight and scents of special floral arrangements, unique plant displays plant walks and talks on each of the four featured plants by experts. In addition, visitors will be able to tour Lan Su with plant guides for each of the four-featured plants. Look for EVEN MORE generous sponsor info coming soon! 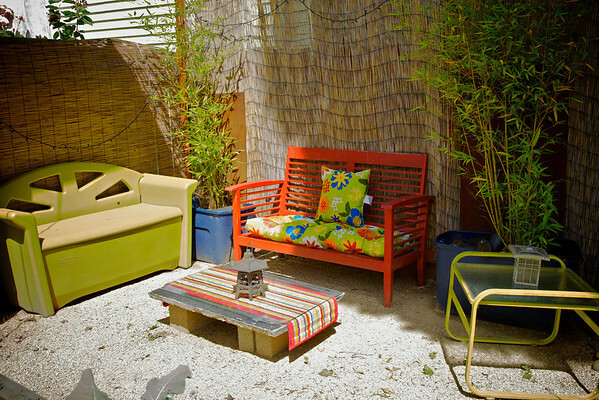 Ruth Morris of Ready Aim Redo is generously donating 3-hrs of her professional design work at a total value of $150!!! "You don't have to have a big budget to have a big impact. Whether you need help with your home or business, I can assist you in creating spaces that are comfortable, inviting, fun and express your personal style." Ready Aim Redo is based in Beaverton, Oregon. My belief is that your space should feel comfortable, inviting and thoughtful and it should be useful. Ideally, it evokes a part of your personality. With more than a decade of design experience, I can help you create a space, redo rooms, merchandise your space and organize what you have into what you want. Backyard Bird Shop generously donating two $10 gift certificates! 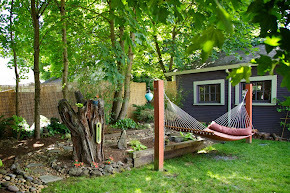 Our shops provide the products and information necessary to transform a typical urban backyard into a habitat for birds, squirrels, bats, mason bees and other wildlife. Our staff members share a love of nature, many with backgrounds in biology, gardening and teaching. At Backyard Bird Shop, we try every day to offer our customers attentive service, plus the highest quality and greatest variety of wild bird products you can find! You’ll be satisfied with our fair prices, and with the great feeling you get when you connect with nature! Friends of Trees is generously donating a Gift Tree, valued at $35! Friends of Trees will plant a Gift Tree for a tax-deductible donation of $35 or a Gift Grove of six trees for a tax-deductible donation of $100. We'll also send a personalized gift card to the person you're honoring. All Gift Trees are planted at the Collins Sanctuary near Forest Park in partnership with the Audubon Society of Portland and Metro. Because of the sensitive nature of the site, we can't mark individual trees, but if you join us at one of our Gift Tree plantings, you can plant your trees yourself and watch them grow over the years. Alex Krebs: Tango dancer, instructor, musician. Alex has been dancing Argentine Tango since 1997 and teaching worldwide since 1998, including performances in Buenos Aires. He has run his all-Argentine tango studio, Tango Berretin, in Portland, Oregon since 2001 and has also studied the bandoneon since 2001 currently directing his sextet. He is completely fanatic about the dance, and shares his passion with his students. He teaches for the social dance floor, emphasizing the improvisatory side of the dance through a strong communication between the lead and follow and on musicality. Alex tries to give his students the vocabulary necessary so that each person can find their own unique way of dancing -- dancing the tango of their own body. Dennis' 7 Dees Nursery on SE Powell Blvd is generously donating one 2012 Official Rose, 'Royal Rosarian'! For 2012, the official rose was named to commemorate the 100th anniversary of the Royal Rosarians -- the Official Greeters and Ambassadors of Goodwill for the City of Portland and the Portland Rose Festival. This classic velvety deep red floribunda comes in clusters of large flowers with excellent disease resistance and is exclusively available at Dennis' 7 Dees. With a red Americans love, 'Royal Rosarian' is a deep velvety, bright, long-lasting rose that displays in great clusters of ruffled flowers that show off against a backdrop of glossy dark red-green leaves. A fourth generation of family ownership, President David Snodgrass believes a longstanding commitment to quality landscaping design, installation and maintenance has kept the organization in business throughout the decades. We’ve always been committed to quality and service and we’ve never wavered from that. Whether we are helping a “do it yourself” customer at our garden centers or offering complete design/build services and maintenance, we’ve always tried to do a great job in every project, and to build trust and relationships with clients that last over the long term. Currently there are four Dennis’ 7 Dees retail garden center locations, three in the Portland metro and one in Seaside. Dennis’ 7 Dees is owned and operated totally separate from Drake’s 7 Dees. Because of the common history and shared 7 Dees name, the two separate businesses are easily confused as the same, but they are not. The two businesses compete professionally, yet in a very family friendly way. 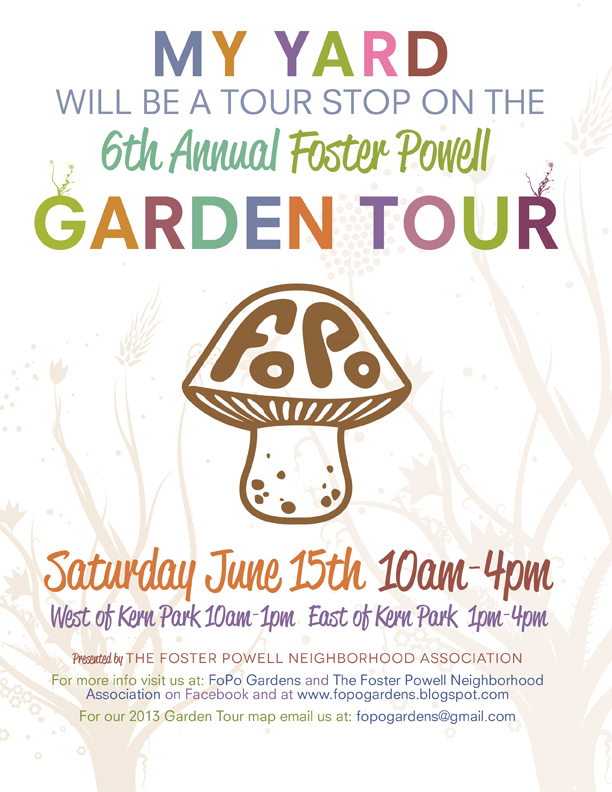 The 6th Annual FoPo Garden Tour is FAST approaching!!!! There are 60 gardens on this year’s tour!!!! some locations open all day! 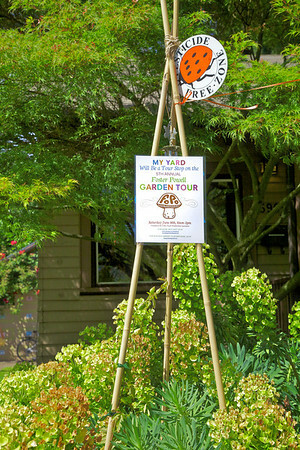 In the meantime look for the fabulously designed yard signs going up all around the neighborhood. and of course Tamra Tiemeyer and all our Garden Tour Committee members for their tireless work! Rain or Shine this is going to be a FANTASTIC Tour! Important: Note that most gardens are not wheelchair/stroller-accessible, not all gardens are child-friendly so please keep a close eye on your children, and pets are not allowed unless they are service-animals. Also, please ask the gardeners' permission before taking photos, thank you. The Fair offers some great features to make your day of shopping simple and fun, so get your little red wagon out and join us for our 29th Fair! The Fine Print: Parking is Free and admission to the Event Center is $3, under 16 free. History of the Spring Garden Fair: What began as a small fuchsia sale in 1984 has grown to one of the Northwest's most popular springtime events. Today the vendors number over 200 and is the regions largest kickoff sale for spring planting. This event is planned, organized and hosted by Clackamas County Master Gardeners. Volunteer leaders plan September through May, and an additional 300 Master Gardener volunteers work at the two-day event. 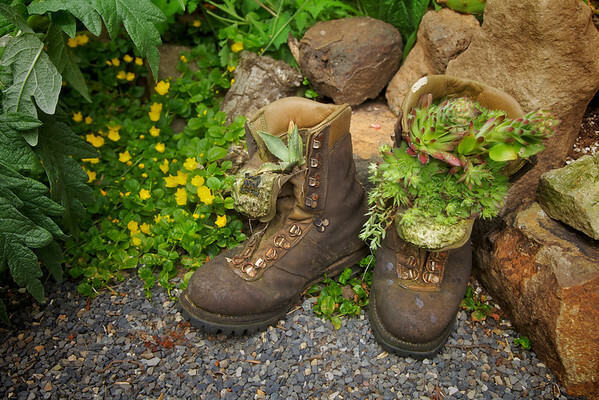 About Clackamas County Master Gardeners : We are a non-profit organization supporting the Oregon State University Extension Service. 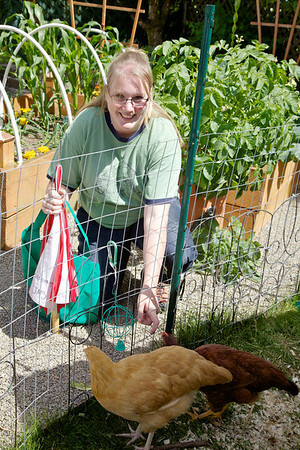 The Spring Garden Fair is a major fund-raiser for the Clackamas Chapter. Proceeds from the event go to fund an endowment providing horticultural scholarships at Clackamas Community College, as well as community grants and programs of Oregon State University and in Clackamas County. 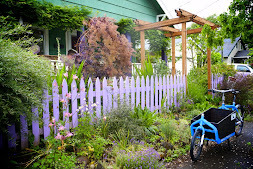 How to get involved: Master Gardeners are Oregon State University Extension trained volunteers providing research based home horticulture information. Please click here for the OSU Extension Service Master Gardener page, and info on becoming a Master Gardener. A wide variety of plants to choose from including native, exotic, ornamental, edible, water- and drought tolerant, small and large. Past sales have included a large selection of tomato starts. All plants are donated by Woodstock neighbors, so are known to thrive in our local climate. 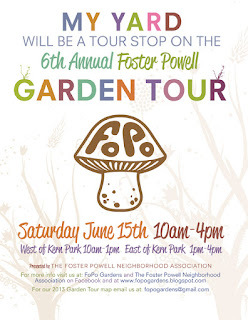 Plant experts will be on hand to answer questions related to planting and care, and plants are priced very reasonably. Sale goes from 9am to 3pm the Saturday before Mother's Day. Wanted: Plant donations and volunteer assistants! For more info contact Terry Griffiths at treeterry [at] yahoo.com.